Relaxing and restorative, a spritz of room spray brings the freshness of white tea and sweetness of blue Camomile into your home. 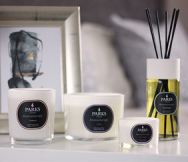 For over 20 years Parks London has been internationally synonymous with purity and quality. Our room sprays are made with the pure essential oils to uplift the spirits and fragrance your home at the press of a button.